After releasing the first beta of iOS 9.2.1 to developers earlier today, Apple also released OS X El Capitan 10.11.3 beta 1 to members of the Apple Developer Program. The new release carries build 15D9c, and though it’s unclear what the focus area of OS X 10.11.3 is at the moment, presumably the release focuses on bug fixes and other improvements. The first OS X 10.11.3 developer beta follows most recent public release of OS X El Capitan 10.11.2 which had its own list of small fixes for the Mac operating system, focused on wi-fi improvements and addressed issues with AirDrop, Handoff, USB, and Bluetooth on Mac hardware. 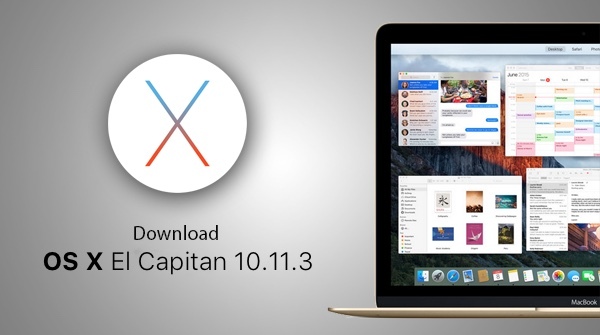 Release notes accompanying the download say that this pre-release edition of the OS X El Capitan 10.11.3 software update will improve the stability, compatibility and security of your Mac, but make no mention of potential new features or enhancements.